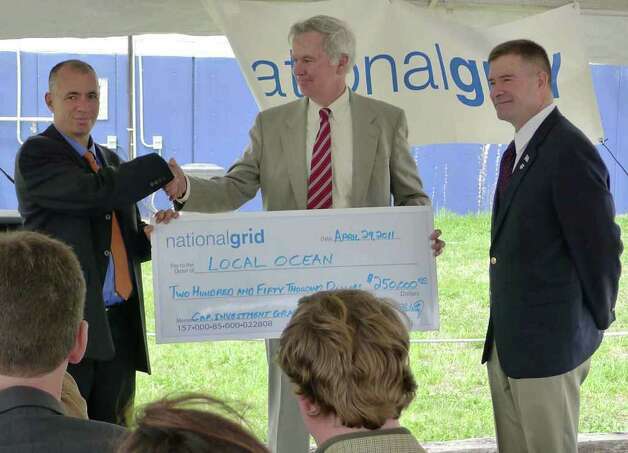 Winner of the 2010 Crystal Apple Award from the Columbia County Chamber of Commerce just months after opening, Local Ocean recently lost its sweet PILOT (Payment In Lieu of Tax) deal with Columbia County. Welcomed with great fanfare and largesse by local development agencies, and much-celebrated in the regional press, Local Ocean has been bedeviled by two patent lawsuits—and laggard in making payments to the County. Local Ocean’s meteoric rise and fall from official favor is not a unique path. The tight-knit and often insular County development elite has a history of patting itself on the back, awarding its own most favored projects before they even get off the ground. Beaten out by Local Ocean, another 2010 Crystal Apple nominee was the rebranded and renovated Historic Blue Stores Restaurant and Bar—reopened under new management just prior to their nomination, then went under again. (Today, it is back open under yet another set of managers, Darren and Tara Buffa, and appears likely to survive.) Passed over that year were the Columbia-Greene Dialysis Center, Catamount Adventure Park, Taconic Farms, and the BeLo3rd business coalition. A longer look at the Crystal Apple award-winners over its history is instructive. Among all award winners listed on the Chamber’s site from 1992-2013, more than one in five (20.5%) are out of business or have retrenched locally. For example, Kaz, Inc. won the award in 2002 and shared the award with Stageworks again in 2005. Dunn Builders, the Crystal Apple winner in 2004, closed its downtown Hudson location after a rash of employee thefts, then had its huge Greenport operation swallowed up by Herrington’s. The Old Chatham Sheepherding Inn (1996) closed, though farm operations continue. A little less than another one in five (18%) have become mired in controversy, fallen out of favor with officialdom, or just fallen into disrepair—such as the once-vibrant St. Charles Hotel, which won the 1997 Crystal Apple but after several management changes no longer features a public restaurant or bar. Its private meeting room and large public event space, once highly-popular gathering spots, today are seldom used. That renders nearly 40% of the 1992-2013 award winners either defunct, disappeared, or discredited. This year’s award-winner, the Columbia Land Conservancy, tarnished its image last year by its coy, behind-the-scenes enabling of the City of Hudson’s heavyhanded seizure of the century-old Furgary Boat Club—using a black-suited SWAT team toting machine guns to subdue three older, sleeping men in their ancestral cabins. Meanwhile, roughly two-in-five awards (38%) have been given to large, established companies and businesses which are closely embedded in the County development establishment, such as Herrington’s, Kaz or Columbia Memorial Hospital. The Chamber’s Board includes Paul Colarusso, whose company A. Colarusso & Sons was the 2009 winner. Other awardees have had seats or representatives over the years on many of the same boards (HDC, CEDC, local and County IDAs, the Chamber itself) which arrange corporate tax breaks, grants and other incentives. Such coziness—bordering on conflict-of-interest—makes the awarding of the Crystal Apple that much less prestigious. Most laughable and conflicted of all, though, is the original Crystal Apple, awarded to The Columbia County Board of Supervisors for its “development” of Commerce Park. Considered a boondoggle from its very inception, Commerce Park took years to find tenants, and two decades later still is sparsely populated. With the Chamber of that era almost entirely controlled by political interests, today’s equivalent of the ’92 Crystal Apple Award would be like this site awarding itself a blue ribbon for Best Columbia County news source. Smaller local businesses—such as the Kline’s multigenerational, family-owned Traditions, or the longest-running merchant on Warren Street, Arenskjold Antiques, here since the 1980s, or the rock-solid folks at Jimmy’s Auto Body in Livingston—rarely seem get invited to the Crystal ball. This is not to say that the Award committee never finds its mark. 2003 winner FACE Stockholm continues to manufacture and maintain a storefront locally, even as it continues to thrive and expand internationally. Camphill Ghent, the 2012 winner, does spectacular work with its residents. The likeable director David Colby, who was brought over from the Berkshires several years ago, has cleared out cobwebs and freshened up the fusty, good-old-boy atmosphere which once pervaded the Chamber’s offices. But these are the exceptions that prove the rule. Perhaps the trophy should be recast as a giant wooden acorn, and renamed The Blind Squirrel Award.